Malapropism - A word or phrase that has been mistaken for another, usually because of its sound rather than its meaning. Everyone has made the mistake of using a word or phrase that they think sounds correct, but in fact is not. Malapropisms make some sense. They have a semantic logic to them, even if that logic makes perfect nonsense. 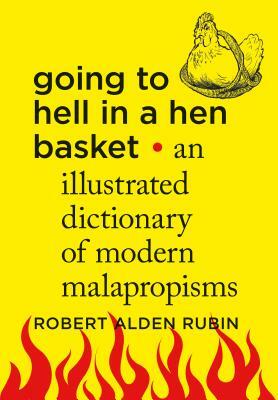 In Going to Hell in a Hen Basket, author Robert Alden Rubin delights in the creative misuse of words and celebrates the verbal and textual flubs that ignore the conventions of proper English. Culled from blogs, the deepest corners of the internet, as well as some of the most esteemed publications, here is a collection of classic malapropisms paired with hilarious illustrations. · adieu, without further - Conflation of bidding adieu (saying goodbye) with ado (complicated doings, ceremony) to mean "without saying anything more." · feeble position - An unborn child in a fetal position seems weak and helpless, which explains the confusion here. The two words also share some sexist cultural and literary associations. Feeble (weak) originates from a Latin word for something to be wept over; fetal (relating to a fetus) originates from the same preliterate Indo-European word that gives us female. · hone in on - Confuses expressions such as finely honed with home in on or zero in on (focus on, locate) and sometimes with horn in on (intrude upon). Homing, as pigeons perform it, often involves flying in narrowing circles until the target is reached. Hone means to sharpen; the malapropism conveys the sense of a carefully sharpened instrument and sometimes cutting in. Perfect for bookworms and wordsmiths, the point here isn't to shame the malapropagandists, but to delight in the twists and turns writers put our language through and to amuse and inform those of us who care about words. ROBERT ALDEN RUBIN holds an M.A. in creative writing from Hollins College, and a Ph.D. in English Literature from the University of North Carolina. He worked as a journalist, is an English instructor at Meredith College, and was an editor for Algonquin Books of Chapel Hill. He lives near Raleigh, North Carolina, with his wife.